The International Policy Commission held its first meeting in early February. Emily Thornberry MP, Nia Griffith MP and Kate Osamor MP gave the Commission an overview of developments in their respective briefs and provided updates on their teams’ work since the NPF meeting. Commission members then raised a number of questions and comments relating to Brexit, the Middle East, defence spending, the aid budget and the arms trade. Is it supposed to be common knowledge what these respective “briefs” are? Where has this been explained? Where were the the “overviews” presented made available? … four priority areas for this year’s consultation: the post-Brexit relationship with the European Union; the transatlantic relationship; Labour’s vision for international development; and Britain’s role in promoting peace and tackling conflict. There was agreement that the Commission should hear evidence from a range of experts during the course of the consultation. We are also told that “a range of seminars and discussions related to Brexit and other key issues” were organised and that “Submissions were received on a range of topics, from members, NGOs, think tanks and trade unions, and were discussed by the Commission during two conference calls in late April”. Is any of this material referenced? Do we have access to any of it? Absolutely not. That is not the way the NPF, in its current form, works. The Commission felt that Labour’s “manifesto position on Brexit made clear that protecting the economy and jobs must be the priority in the Article 50 negotiations”. The trouble with this seemingly definite-sounding statement is that on analysis it turns out to be near meaningless. The issue is whether the prospects for jobs and the economy are better in or out of the EU framework (even as a non-member). The Commission offers no argument on that. The assumption seems to be that anything that disturbs current arrangements will be a threat to jobs and the economy and that therefore it is better to stick with those arrangements. The absence of any analysis from such thinking is all too evident. Apparently “A number of submissions offered suggestions as to how Britain could secure a trading relationship with the EU that is tariff-free, impediment-free and beneficial to all sectors of the economy” but the Commission has not seen fit to make this information generally available. The Commission clearly approved that “The manifesto outlined Labour’s commitment to a robust, evidence-led defence policy, underpinned by a sustainable British defence sector”. The claim to have “evidence-led” policies is that of people whose concept of “evidence” is so shallow that they have not understood that the same evidence can be used to reach entirely different conclusions according to the initial starting point and general philosophy. Policies clearly need to be supported by evidence but the idea that they unambiguously come out of the evidence by themselves is, sorry to say, nonsense. Not only that but some parts of this report show a remarkable lack of interest in the available evidence. Thus we are told “the manifesto made clear the party’s commitment to NATO, the renewal of Trident …”. No arguments and no evidence are considered necessary. As several submissions highlighted, the Conservatives’ short-sighted cuts and mismanagement of defence projects have led to delays in delivering crucial equipment and gaps in operational capabilities, and have ended up costing the taxpayer more in the long run. Their failure to publish a National Shipbuilding Strategy in the promised time frame has let down the UK shipbuilding industry. Very good but where is the detail and what does Labour propose? What happened to all the good work done by John Penney? Along with deep ties to Europe, Britain’s partnership with the US has long served as a key pillar of British foreign policy. With close cooperation on Intelligence, diplomacy and counter-terrorism, and as the two biggest spenders on defence in NATO, Britain and the US together play a pivotal role in international security. The entirely uncritical nature of this claim, its absence of any sort of analysis of the interests served by this relationship, is breathtaking. It is of course easy to say that we are concerned about various hot-spots such as Kashmir, Yemen and Palestine and the report duly does that. But that is not the same thing as an analysis of international power blocks and the interests that they serve. Our relationship with the US, it is further explained, “has always been based on shared values, including respect for the rights of women and minorities and a strong commitment to democracy, freedom of the press and the rule of law.” Maybe someone should tell the women of Saudi Arabia about that. Those who remember the Vietnam war and the toppling of the socialist government in Chile might also be surprised by this claim. One could also wonder about the Commission’s view of UK/US support for the murderous Khmer Rouge in Cambodia even when it had been deposed by the Vietnamese. A rather long list of such deviations from “a strong commitment to democracy, freedom of the press and the rule of law” could be drawn up. It is good that the Commission supports Labour commitment to a strong international aid programme, as stated in the report, but some sort of indication of views on the strength and weaknesses of current aid programmes would have been apposite. We learn from the report that “For Labour, the protection of the British people will always come first”. This is another of those seemingly clear statements that dissolve into nothing on investigation. What can it mean? Protection of the British people comes before securing alliances with countries with similar interests? Does it come before working for a world no longer destabilised by gross international inequality? The claim turns out to be pure rhetoric of the sort demanded by the tabloid media. The international section of the Manifesto is not without its problems. For example, like this report, it also states that UK cooperation with the US since the second world war has been based on shared common values with the implication that those values have at all times since WWII been right and proper ones. It also promotes Trident renewal with no argument. Nevertheless the Manifesto advances a number of clear ideas which go beyond anything in the report. Thus the Manifesto calls for recognition of the state of Palestine, for a restructuring of the UN to overcome abuses of the Security Council veto, for much stronger controls to ensure that UK weapons are not sold to countries likely to use them contrary to international humanitarian law. It also calls for robust regulation of the aid programme to end the self-regulation of private contractors involved in aid programmes. Reading reports like this tries my patience. What are the left-wing members on the Commission doing. For example the Commission includes Kate Osamor. And what about the Shadow Cabinet members? Nearly two years ago Emily Thornbury produced an excellent defence review paper which then disappeared from view with no discussion. She is also a member of the Commission. Like the report from the Early Years, Education and Skills Commission report which I reviewed previously this report contains no references to the materials and information produced for its various meetings. It contains no references to back-up studies and it makes no attempt to lay out alternative positions on issues known to be controversial within the Labour Party. In short it is political drivel. There are those who are opposed to the NPF and want to return to party policy being decided at annual conference in the few days that it meets. I am not one of them. We need a standing body that considers policy throughout the year. The issues are far too complex to be decided by a few motions at annual conference. What we need is a reformed NPF with protocols to ensure that it organises discussion in a way that keeps members fully informed of the materials it handles and also about the contending views on controversial issues. To my great disappointment there appear to be no plans currently being considered to bring about this change. Posted in: International, Labour, Politics, War/Defence. 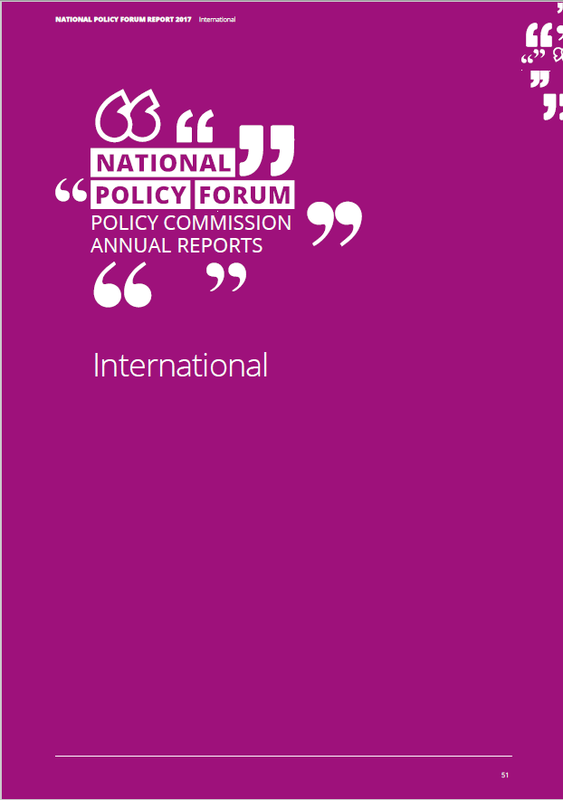 Unlike the NPF Economy, Business and Trade Annual report, which I would argue , has moved to a slightly more “Corbynist Left Keynsian” position , in the light of the obvious popularity of our 2017 Manifesto, on International/Defence issues , Labour policy is simply becalmed in uncritical pro NATO, pro USA empty sloganizing. Yet I strongly suspect our members, voters and potential voters are ready for some significant policy shifts, on Trident and the related mess of our current UK Defence Strategy, on unwavering support for both NATO and the mercurial Trump-led USA’s global adventurism. As I explained in my earlier articles, UK Defence policy and procurement scandals should be an open goal for some critical analysis. Where is there evidence of any critical input from the supposed Labour Left on this Policy Commission ? Good summary David. If ever there were a time to chart an independent foreign policy, the idiocy of Trump means this would be it. It won’t get any easier than this to convince Britons to end the “special relationship”, but the Labour Party is as wedded to it as ever. We can’t just blame the NPF for this, although they are certainly worse then other parts of the party. Clive Lewis gave that rather sickening pro-NATO speech at last year’s conference and presumably he wouldn’t have been allowed to do this without the leadership’s consent. 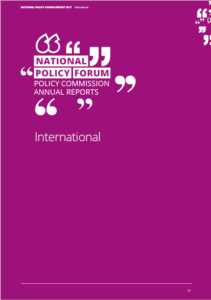 Very good report.Yes, the ‘shared values’ guff would always be objectionable, but given Trump’s incoherent warlike rantings in the last few weeks it cannot be at all acceptable for this to be passed at conference.